Wilfrid Laurier University’s student-athletes are encouraged to bring their best not only in their sport, but in all aspects of their lives. Joe Sheridan, a cross-country and middle-distance runner, was recently recognized for being an exceptional student in all forms. Sheridan, a student in the Bachelor of Business Administration (BBA) program, was selected by the College Sports Information Directors of America (CoSIDA) to join the 2018 Google Cloud Academic All-District Men’s Track and Field/Cross Country team. CoSIDA recognizes top student athletes for their combined performances on the field and in the classroom. In the 2017/18 season, Sheridan was Laurier’s top performer at every cross country meet he competed in. 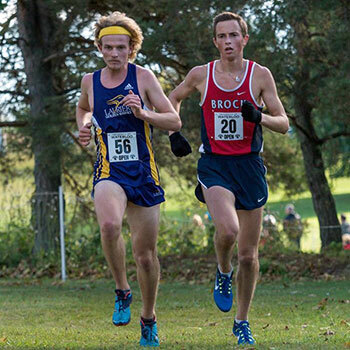 In September, he won the Waterloo Invitational from a field of 100 competitors before finishing 25th at the Ontario University Athletics (OUA) Championship, his best result in four years competing at the provincial championship. He then capped off the year with a 62nd place finish at the U SPORTS Championship. Excellence is important for race scores, but it is just as crucial in academics. Sheridan transferred the high-performance skills he developed as an athlete to the classroom, with an impressive 3.85 GPA in the BBA program at the Lazaridis School of Business and Economics. “Running has helped me academically by making me effective at managing my time and giving me a break from school work,” says Sheridan, who spent four years juggling the demands of varsity athletics and a busy academic schedule. On the other hand, devoting endless hours in the classroom has also helped Sheridan to be successful in his sport and beyond. “My time in the business program also strengthened me by challenging me. The lessons I learned from my time here will stick with me for life,” says Sheridan. Student-athletes and students alike find connections in Laurier’s strong community, where they are supported to achieve their full potential. Sheridan credits his support system at Laurier for much of his drive. Sheridan is finishing up his last semester this summer and is set to graduate this fall. He will return to Laurier as a graduate student in the accounting diploma program, where he plans to continue working towards a CPA designation. The Google Cloud Academic All-America awards are widely recognized as the top academic achievement awards presented in the U.S. and Canada college sports each season. Over the years, four Laurier student athletes have earned Academic All-America recognition.